Eric is a debt counsellor (as Gaffney himself once was) whose days at the Cleator Moor Money Advice Shop in west Cumbria are spent helping anxious debtors avoid making payments. Mired in more debt than most of the clients he counsels, Eric maintains a façade of easy solvency for his girlfriend, Charlotte, while sneaking off to Manchester to feel alive again, to borrow some more cash from various shady characters, and to have peculiar sexual encounters with his first love, Julie. Gaffney's strength is creating strong characters, and this debut brims with them - Doreen, the spendthrift housewife; Mr Shopaloan, a creditor-turned-debtor; Charlotte, brilliantly irritating in a way that is difficult to define; and a sinister man dressed as a lemon who may or may not be responsible for the spate of caravan photographs Eric has been receiving, each with a single, gnomic word pasted on the back. With a ruthless eye and pitch-black humour, Gaffney explores a consumer culture in which exploiting the welfare system is both a necessity and an addiction, and in which hypocrisy is endemic. This clever novel couldn't be more timely - it forces us to confront society's insatiable thirst for credit, and our own sense of entitlement. Cometh the hour, cometh the novelist. David Gaffney’s breezy but savage satirical caper about the adventures of a dodgy debt counsellor and his hapless clients may not win many prizes for subtlety. But, just this week, it would be harder to imagine a book that scored a more penetrating bull’s-eye on the target of the moment. In the run-down urban badlands of West Cumbria, Eric not only doles out survival tips about the “fascinating worm-holes” of the banking and benefits system to the chronically indebted. He practises what he preaches with a maze of scams designed to keep him ahead of collectors and courts. This house of maxed-out cards crashes down, but not before Eric’s wheezes have lit up the thrilling “danger” and “chance” of big borrowing. As he plans a nuclear solution to his credit crunch, Eric imagines he will miss the “money madness”. But will we? In the no man's land of Cleator Moor, west Cumbria, Eric McFarlane is a debt counsellor. Unbeknown to his desperate clients, who are harassed daily by loan sharks, Eric is experiencing a deeper financial crisis than any of them - and his ability to juggle is beginning to fail him. His partner Charlotte is oblivious to this, and also to Eric's jaunts to Manchester to visit his childhood sweetheart. She does begin to notice, however, when photographs of caravans bearing oblique one-word messages arrive in the post, Eric is stalked by a figure dressed as a lemon, their cat is poisoned, and a sinister development officer threatens his livelihood. Meanwhile, he hatches an outrageous plan to run a scam with hapless client Doreen - and Gaffney's uneasily jocular, brilliantly observed caper descends into full-on grisly nightmare. Never Never is the brilliant debut novel from David Gaffney. Gaffney is best known for his Sawn-Off Tales. His writing combines observation, wit and rebuke about today’s society through crafty description and brilliant character depiction. Never Never tells the tale of Eric, a professional financial juggler, as he finds himself irrevocably in debt. He begins to receive postcards with one word on each - Coerce. Calculated. Harassment. This puzzle further deepens the anxiety of a man on the edge while he is trying to maintain domestic bliss with his girlfriend, Charlotte. With the credit crunch looming, Never Never is the story of how our society is addicted to the commodity and the burgeoning norm of debt culture that encases daily life. Gaffney tells it like he sees it. His work is incredibly originally, wonderfully humorous, and revealing about the abundance and sadness of consumerism. Never Never, along with Catherine O’Flynn’s What Was Lost, demonstrates Tindal Street Press’ commitment to new talent and challenging content. 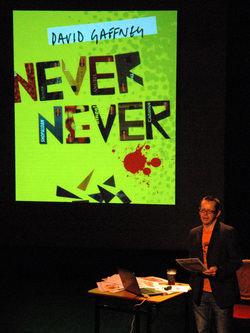 Never Neverby David Gaffney"READ WITH CARE" should be attached by butterfly label to the jacket of NEVER NEVER. Because unless the reader accords this novel the respect with which he would read the menu in an expensive restaurant, he will miss the point. Each chapter arrives with as much variety as soup, fish, meat, pudding, etc.,, but, trust me, it all comes together in a deeply gratified digestive tract. Appreciation of NEVER NEVER demands a sophisticated palette. To begin with, our hero, Eric McFarlane, is not at all heroic. He is in his late twenties, and not very prepossessing. He has drifted from education to the dole, back to education, and after more dole to the Cleator Moor Money Advice Shop, where he helps the poor to rob the rich. He is understanding, empathetic and non-judgmental. He keeps a box of Kleenex on the corner of his desk. In fact, he himself becomes rather clever at robbing (Nat-West, Barclays, Lloyds, West Newland Trust, Market Trust,, HTC, and even the Cleator Moor Money Advice Shop) in order to support a woman of very little brain with whom he is no longer passionately in love, but from whose warm embrace he daily drives to his office in the St. Cuthbert's Centre, a converted church shared with the community samba band, the chittering of whose precision instruments pierce the walls of the old church. His desk stands below the stained glass windows of The Good Shepherd (repaired with Cellotape) and The Annunciation. Here he sits, responding to an endless queue of indigent clients who are stained a bilious blue green thanks to the robes of the Angel Gabriel, or printed over with Well Done Thou Good And Faithful Servant. Eric dreams and fantasizes, of course he does. But his fortunes take a sudden turn for the worse, and he gives up hope (rather too quickly) of saving himself. Only when he perceives his lover to be in great danger does his spirit take light, and, although he has lost everything, endured pain and humiliation, and is almost certain to lose his own life, he at last earns our unqualified admiration. Well, perhaps that is over-egging it a bit, but only a soupcon. NEVER NEVER is a novel of today, for today's readers, with today's humour, written with wit and compassion by one of today's most brilliant writers.